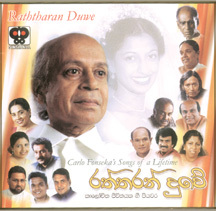 MUSIC: Professor Carlo Fonseka's latest compact disc Raththaran Duwe was launched in Colombo recently. The CD consists of 16 songs written by him and sung by leading singers. After graduating from the University of Colombo he proceeded to Edinborough University for his postgraduate studies. Thereafter he served the University of Colombo and the University of Kelaniya as a professor in the medical faculties. During the 60s Prof. Carlo Fonseka came to limelight as a fearless free thinker and vociferous rationalist. He worked very closely with the late Dr. Abraham T. Kovoor and challenged institutionalised myths and superstitions. Apart from his services as a medical man, Carlo Fonseka tried his hand at writing lyrics for Sinhala songs. He became a lyricist by writing the memorable song. 'Pem Sina Sun Vuna' for Victor Ratnayake who sang it in the 1970s. He launched his first cassette and CD entitled 'Kalochitha Gee' in 1992. Prof. Carlo Fonseka studied music when he was a student at St. Joseph's College, Colombo 10. Being a sensitive person he was able to grasp the inner feelings of man such as kindness, devotion, happiness and love and wrote his lyrics giving vent to his feelings. Most of his songs became hits as they were sung by veterans such as Pandith Amaradeva, Edward Jayakody, Amarasiri Peiris, Rohana Weerasinghe, Indrani Perera, Anton Charles, Sunil Edirisinghe, Victor Ratnayake, Deepika Priyadarshini Peiris, Lakshman Wijesekara and Hirantha de Silva. Raththaran Duwe is a Singlanka production.